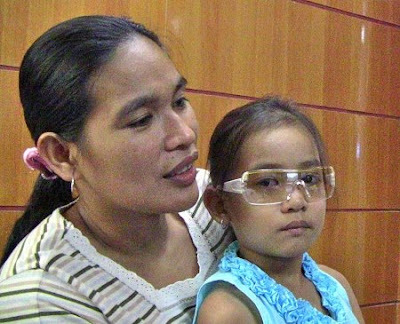 Kia Mae (in glasses) and mother, Margarita, just 10 days after the girl’s eye surgery. “She wants to be like Venus Raj,” mom says of daughter. And the Dandanas’ Facebook photo that started it all. From left: Grandpa Alito, Kia, Grandma Zedai, and cousin Joy. And Dr. Maria Antonette Cases and Margarita after the bandage was taken from Kia’s eyes. ZAMBOANGA DEL NORTE, Philippines - Even at the tender age of 4, Kia Mae Dandana already felt the pain of being teased and laughed at. In the neighborhood where she lives, her playmates – sometimes even the adults – called her libat (squint-eyed), which often forced her to stop playing and run home straight to her mother, Margarita, to seek comfort. She was playful and energetic, but hearing people make fun of her always made the child both angry and sad. To ease Kia’s pain, Margarita would just hug her tight. Just recently, Kia, now 6, received the proper medical treatment she needed. 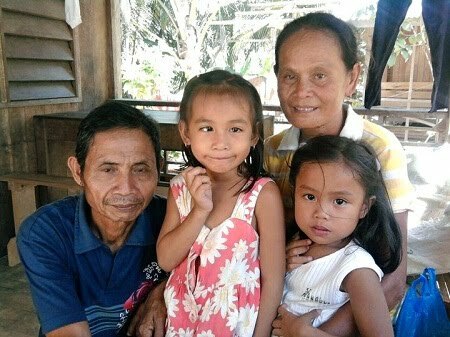 No, her family didn’t have the money, but the mining company where Kia’s father, Roger, is employed – TVI Resource Development Philippines, Inc. (TVIRD) – noticed the little girl’s condition and provided her and her parents the required support. Through the company’s Community Relations and Development Office (CReDO), Kia was linked up with Tzu Chi Foundation, a Buddhist charity organization founded in Taiwan, which provides, among others, medical assistance to the poor. Tzu Chi are Chinese words for “compassion” and “relief”. Now, barely two weeks after her operation, Kia is a “new” girl in her neighborhood. Kia’s eye surgery was administered by Dr. Maria Antonette Aguilera-Cases, a Zamboanga City-based eye specialist who traces her roots to Siocon, incidentally the host municipality that encompasses Canatuan, site of TVIRD’s copper-zinc operations. Dr. Cases is one of doctors of the Tzu Chi Great Love Eye Center, a project of the Tzu Chi Foundation. The Eye Center, located at the compound of the Zamboanga City Medical Center, is equipped with state-of-the-art sight-saving apparatuses. The comely doctor told Margarita that Kia was the 16th child she had operated on since the Tzu Chi began providing its services to indigents in Zamboanga City and other parts of Mindanao and the Visayas in 2004. “Kia was most behaved,” Margarita recounted what Dr. Cases had related to her. “Our girl did not cry when Dr. Cases’ staff began administering the drug that will make her sleep throughout the operation. It lasted three hours. “Clearly, Kia understood that she will undergo an operation that will correct her eye defect,” Margarita continued. “She just asked me where she was going when I dressed her with the hospital gown that she had to wear inside the operating room. She only cried when she could not see me with the bandage covering her eyes after the operation. But when Dr. Cases assured her she will be able to see the following day after the bandage will have been removed, she immediately stopped crying,” Margarita said. Margarita related that they had waited for such a long time for the doctor who was then still busy attending to other patients in the Eye Center. She had got frustrated and told Kia that she just wanted to go home because there were plenty of chores that needed to be done at home. Touched by her daughter’s question, Margarita hugged her daughter and resolved that she will not miss that opportunity to give Kia the chance to live a normal life. The child’s eye condition, according to Margarita, was not inborn. “About five years ago, Roger and I were working in a factory in Manila. Kia was left in the care of a relative. While her nanny ran an errand, Kia fell from our small terrace. She was just more than one year old then. The fall affected part of her eyes and head. Her forehead was swollen. It was so big that she looked like a hydrocephalus patient. Five days later, her eyes squinted. Her doctor told us that an eye nerve suffered trauma. 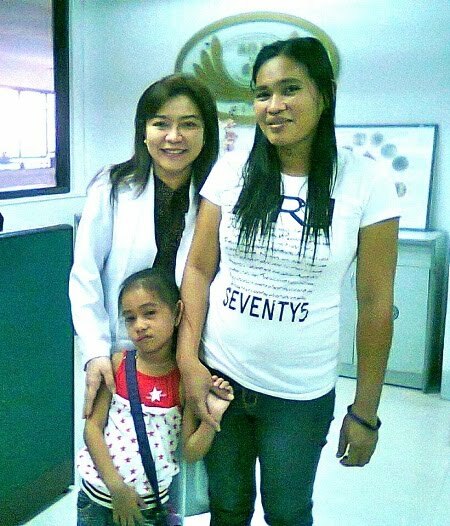 But we were assured that her condition can be corrected through an eye operation,” Margarita recalled. But when she brought Kia to an eye specialist in Zamboanga, Margarita was told to prepare P150,000 (about US $3,400) for the operation. “The amount was totally out of reach for us that’s why I told Roger that we had to save if Kia’s eye condition is to be cured. Since he is the only one working, it would take years for us to raise the needed amount,” Margarita said. Kia’s condition became known to TVIRD through Facebook. John Ridsdel, TVIRD Senior Vice President and Chief Operating Officer, was going through one of the recent posts of Noelle Nazareno, a former CReDo staff member, when he noticed Kia in one of the photos. The girl’s photo, together with her family, was taken when Nazareno visited the Dandana household to bid them goodbye. Ridsdel immediately called up CReDO’s Alasco and requested the latter to assist the Dandana family regarding Kia’s case. Shortly thereafter, Alasco learned about Tzu Chi and proceeded to coordinate closely with the foundation.